The Romance Dish: One for me...One for you. Questions, that is! Between Molly's computer virus and human virus and my crazy work schedule and leaky senior memory, neither of us said anything about possible giveaways when we were planning this interview. So.... Sorry this is late but Molly has very generously offered an ARC of her first single-title book, CAN'T BUY ME LOVE to one randomly selected person who leaves a comment on today's blog. The book is a July release so ARCs won't be available for a few months yet but, as soon as Molly receives them, a copy will be winging its way to today's winner! Thanks, Molly! Janga and I met online several years ago and quickly discovered that we share a similar taste in the romances we enjoy reading. When I find a new author (or book) to love, she's one of the first people I share the news with and she's placed more than a few authors on my "must buy" list with her enthusiastic recommendations over the years. One of those authors is Molly O'Keefe. I had the pleasure of meeting Molly this past summer at the RWA National Conference in New York City. We struck up a conversation in the bar (you meet the most amazing people in the bars at RWA conferences!) and while we were chatting, I had one of those "lightbulb" moments. Wouldn't it be great, I thought, if Janga (a dedicated fan of Molly's writing) could interview her for The Romance Dish? I pitched the idea to Molly and she was on board immediately...but with a delicious twist. Turns out Molly is a fan of Janga's and, while she was enthusiastic about the idea of being interviewed, she also wanted the opportunity to pose some questions of her own. What a great idea! I loved it! Now, I just had to sell the idea of being interviewed to Janga. Happily, she agreed - with only minimal begging on my part - and what follows is the wonderful end result of one reader interviewing -and being interview by - one of her favorite authors. Enjoy! JANGA: I started reading your books with the Notorious O’Neills and then eagerly glommed your backlist. I noted that the sense of family that I found appealing in the O’Neill books is characteristic of your work generally. Is this something you’re consciously creating or has it just happened? MOLLY: I cut my romance reading teeth on Elizabeth Lowell and Judith McNaught historicals and I LOVED the family connections. As a reader that family relationship was a very close second to the romance. So, when I started writing I didn't even think about it - the family dynamic was just there. The more books I write the more conscious I am of it because I don't want to over do it, or repeat myself. My mother - who is lovely - gets a little frustrated with all the bad moms in my books, but bad moms are fun reading, aren't they? They certainly are fun writing. JANGA: Writing bad moms must be fun. They seem to be popular with romance writers. For me, reading is foremost about the characters, and I fell in love with yours. Who is your favorite of your characters? Who was the hardest to write? The most fun? MOLLY: I was just having this conversation with another writer. Sometimes I can just slip into a character's skin and it's effortless and joyful. Some characters resist and fight and are a mystery all the way through. The good characters have been: Sam and JD from The Son Between Them Savannah from The Temptation of Savannah O'Neill Mia from His Wife For One Night Tara Jean from Can't Buy Me Love Eli from Can't Hurry Love and in the Superromance I'm writing right now, Jeremiah Stone, the hero of Unexpected Family The worst have been Ian and Jennifer from The Story Between Them - they did not get a long - AT ALL. Carter from The Scandal and Carter O'Neill Lucy from Unexpected Family. JANGA: Oh, I loved Sam and JD—theirs is a really different romance. And Savannah is a great character! From the beginning of your career, you have written series. I’m a series addict and understand the appeal from a reader’s perspective. What is the appeal of writing a series? MOLLY: I think I like writing series because I love to read them. Getting that overarching plot that ties the three books together is such a fun puzzle that when it works out - it's exhilarating. When it doesn't...uh oh. But I also like seeing little glimpses of couples after their HEA. It creates a real sense of the author's world - I always dreamed I could step into those Judith McNaught historicals and meet all of those characters. I think readers like that. I know I do. JANGA: So do I. There was a lively discussion about this at Heroes and Heartbreakers last week. To quote Shakespeare out of context, “what’s past is prologue,” and the Dishes and dishettes are always interested in the prologues of our favorite authors. When did you start writing? What is your “call story”? MOLLY: I've always wanted to write Romance novels. And I started right out of college - not that I ever finished any of those books. But once I did start finishing and submitting I actually sold my second book. I was living in California and working as a substitute teacher. When the editor called she wasn't aware of the time change and it was six am. I thought she was a principal asking me to come sub at her school and I kept saying "I have a job today, sorry." Finally, after about the third time the penny dropped and freaking out ensued. JANGA: LOL I can sympathize with that 6:00 a. m. response. What’s your favorite part of the writing process? MOLLY: Those little moments I never see coming. Writing the Mitchells Of Riverview Inn series, it was only supposed to be two books. But then I had this lightning bolt about a secret third brother. One of the best moment of my writing life. JANGA: I love those moments too—“the given lines,” as a French Symboliste poet called them. What authors have influenced your writing? What authors do you like to read? MOLLY: My three favorite romances are Dream a Little Dream by Susan Elizabeth Phillips, The Shadow and The Star by Laura Kinsale and Lover Awakened by J.R. Ward. I have those books in my head every time I sit down to write - it's maddening. MOLLY: Can't Buy Me Love and its sequel Can't Hurry Love were total dreams to write. They're longer and a bit more complicated - way way way hotter, which is a total surprise. It was fun figuring out which envelopes I could push and which needed to stay the same. Sometimes it felt like I was learning a whole new skill set and other times it felt like I'd been writing single title all along. I loved it. JANGA: Is there anything you can share with us about Can’t Buy Me Love? What's sure to make us fall in love with the newest Molly O'Keefe book? MOLLY: Did I mention it's hot? Because it is. It's also very emotional. Lots of secrets and drama. Family angst and it's hot. Oh, and the hero plays hockey. JANGA: Secrets, family angst, hotness—I love it already. Can you tell us what comes next after Can’t Buy Me Love? 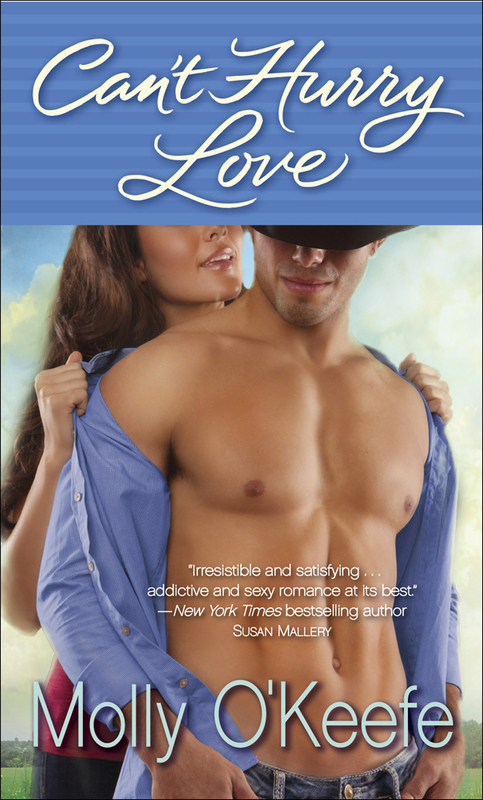 MOLLY: Can't Hurry Love comes out in July and the third book in the Crooked Creek Series comes out in November - This Can't Be Love. JANGA: Is there a genre other than romance or a subgenre within romance that you still dream of writing in? MOLLY: Actually, no. I love to read historical romance, and paranormal romance and YA is very exciting right now. But my heart belongs to Contemporary. JANGA: Good to know! I’m in favour of more contemporary romance. Did your recent trip to New Zealand give you ideas for new books? MOLLY: What a trip! We were there in part for the World Cup of Rugby - and those guys are total hero material... I fell in love many many times. I think I'll be doing more sports heros. JANGA: A quick five is always a fun way to end. I used to be an owl but children put an end to that!! Coffee and far too much of it. Mountains - I really love to hike. Though we had some amazing moments on beaches in New Zealand...ah...too hard...can't choose. City slicker or country mouse? I grew up in the country and moved to the city - so a little bit of both. But it would be very hard to give up the excitement and convenience of my city. I can get Sushi delivered! How do you give that up? Last minute holiday shopper or finished by September? Last minute - my dad and I used to do all our shopping on Christmas Eve. We gave a lot of very bad gifts! Now it's Molly's turn to ask the questions! MOLLY: When did you start reading romance? Do you remember the ones that first got you hooked? Do you still read any of the authors you started with? JANGA: I started reading romance the summer I turned ten when my mother turned me loose with her books. I read Jane Eyre, Pride and Prejudice, and stacks of Agatha Christie mysteries and Emilie Loring and Grace Livingston Hill romances that summer. I’ve been reading a mix of literary fiction and popular romance, and mystery ever since. But I think I was already hooked on romance from reading Louisa May Alcott, L. M. Montgomery, Maud Hart Lovelace, and Laura Ingalls Wilder. I’ve certainly reread Jane Eyre and Pride and Prejudice many times. The Loring books seem a bit dated now, although I occasionally reread one. I find the Hill books too preachy. But there are authors like Mary Balogh, Jo Beverley, Mary Jo Putney, and Nora Roberts whom I started reading later but early in their careers and still read today—more than twenty years after I first read them. I love the lasting impression those first romance novels have. MOLLY: Have you always been a romance advocate? JANGA: I’ve always read romance, but my advocacy is fairly recent. From college on, I was a closet reader. Romance fiction was mocked by my English professors and most of my English major friends. One friend in grad school, upon finding out I read romance novels, declared “They’ll rot your brain.” Reading romance was also viewed as a betrayal of feminism. The wider acceptance of romance fiction within academia has developed since Pam Regis’s A Natural History of Romance. 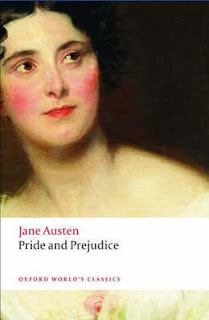 MOLLY: The snobbery is wide-spread, particularly among people who have never even read a romance novel. And on the feminism note: one thing I love about your reviews is how thoughtful they are - how they seem to tie into a part of womanhood, or community or family that is larger than the book - is that why you read romance? To feel in touch with those things - or to think about those things? JANGA: I don’t think I read consciously for those things, at least not on a first reading when it’s the characters who make or break the book for me. But I do like making connections—part of my INFP (Introverted iNtuitive Feeling Perceiving) personality—and my training encourages me to be analytical when I write about books. At the analytical stage, considering contexts is one of the delights of reading. MOLLY: It is a delight! I love trying to pull apart the books that really work for me and figuring out the magic. Usually I just end up sucked into the story again. How has the explosion of the romance reading on line community impacted the way you read? JANGA: It’s increased my TBR stack a hundred fold. I do significantly less rereading now than I used to because I never catch up with the new books awaiting me. It’s also made me a more adventurous reader. I’ve read subgenres that I would never have tried when I was reading in isolation. Most significantly, it has given me an awareness of being part of a community that values reading romance. Some of my closest friends now are people who were first reading buddies whom I met because we read the same writers and joined in conversations about their books. MOLLY: Has it changed the way you review or present yourself on social networking sites (good reads, facebook etc…) or how you view other authors, reviewers etc??? JANGA: Hmm. I’m not sure. It was the intelligence and camaraderie of the online romance community that gave me the courage to identify myself openly as a romance reader. Without that honesty, I’d never have become a reviewer, a blogger, a tweeter; I’d never have seen myself as a reader with things to say about romance fiction that were worthy of an audience. Squawk Radio and the Eloisa James/Julia Quinn bulletin board (both now defunct) are where I developed an online identity. MOLLY: How has your career as a teacher impacted the way you look at books and review them? 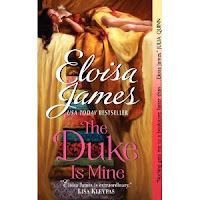 JANGA: There’s a scene in Eloisa James’s soon-to-be-released novel, The Duke Is Mine, where the heroine explains the meaning of a poem to the hero and then explains what would be lost if the poem were different. I connected with that scene so strongly because it was such a teacherly moment. That desire to say, “Oh, look at this! How wonderful! This is what it means. This is why it has to be exactly this” is certainly something that shaped me as a teacher and shapes me as a reviewer. Maybe that’s why I prefer reviewing books I love and keeping silent about those I dislike. MOLLY: "This is why it has to be exactly this" - I love that! I prefer telling the world about books I love, too. Spreading the joy is so much more fun than spreading the pain. What is your favorite thing about romance novels? JANGA: The happy endings. Life is messy and often filled with pain and disillusionment. I love spending time in a world where love always redeems the rogues, heals the broken, and finds “the we of me” for the lonely—and one where women deserve and attain happiness and self-fulfillment. MOLLY: What is your least favorite thing? JANGA: The covers. I am not a fan of clinch covers. I dislike having to hide them from the younger grands. I’m also not crazy about buzzword titles. MOLLY: The covers are a double-edged sword that's for sure. Are you also writing romance? If so what genre? JANGA: I am. I’ve written one book and have partial mss. of two others in a contemporary trilogy with a Southern setting. And I’m excited about a new idea that surfaced just this week inspired by a picture on a web site. MOLLY: Oh! New inspiration - one of the best parts of writing. Enjoy it! If you could step inside one romance novel, or one world created by an author - whose would it be??? JANGA: That’s a toughie. If I were strictly a short-term observer, I think I’d choose Jo Beverley’s Malloren world. I’d love to see Rothgar. If I were visiting the world of the book as Jasper Fforde’s Thursday Next does, I’d go with a contemporary. I have to have my mod cons. Maybe Kathleen Gilles Seidel’s Till the Stars Fall or Ruth Wind’s (Barbara Samuel) In the Midnight Rain or Mary Jo Putney’s The Spiral Path. I’d love to have dinner and a long conversation with any of those characters. MOLLY: It would be hard to forgo showering to see Rothgar! You say one of your favorite books is Anne of Green Gables (I'm an Emily of New Moon girl myself) - what do you love about that book? As a book for girls and about girls what do you think its lasting influence is on girls? JANGA: This question is a timely one since I’m working on a blog post on Anne. She is such a flawed endearing mix of insecurity, intelligence, imagination, honesty, and a huge, loving heart. Mark Twain called her “the dearest and most lovable child in fiction since the immortal Alice.” I’d cut the comparison from Twain’s comment. I find her far dearer and more lovable than Alice. Without getting bogged down in the terminology of literary criticism, I think Anne’s continued appeal can be attributed to her combination of femininity and feminism. She’s a girly girl who has a BFF, longs for puffed sleeves, wishes her hair were a different color, and imagines herself “an enchanted princess shut up in a lonely tower with a handsome knight riding to [her] rescue on a coal-black steed." She’s also independent, assertive, and a usurper of the power of naming, a power usually reserved for males. She signals girls that it’s good, even empowering, to be all those things. 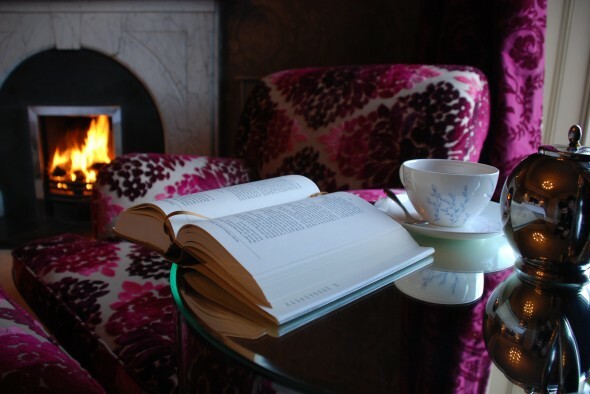 JANGA: The sound of rain against the window, my favorite chair and a cozy throw, hot chocolate with marshmallows, a stack of historical and contemporary romances (a mix of new books and comfort rereads), no phones or doorbells ringing, and a long stretch of hours to do nothing but read. Or substitute lazy day on a bench by the river with wild azaleas blooming, a spring breeze stirring the pine trees, a thermos of sweet iced tea, and a bag of the same books. MOLLY: I like your lightening round - so I'm going to copy yours. Night owl. I wake up as late as possible, an eyelash at a time. Tea. I’m Southern. We’re given sweet tea in our baby bottles. Mountains, every time. With a big lake to add the water element. Country mouse who likes visiting the city—but briefly. I finish my shopping on Christmas Eve. Molly and Janga, thank you both for giving us this fascinating "behind the scenes" glimpse into your lives. We truly appreciate all the time and effort that went into these interviews! Readers, if you could interview, and be interviewed by, the person of your choice, who would you choose and why? Do you have any questions for Molly or Janga? Post them in the comments. They'll be dropping by throughout the day! 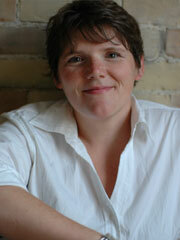 Molly O'Keefe is the RITA© Award Winning author of more than fifteen category romances. Her first single-title romance, CAN'T BUY ME LOVE will be released June 2012 and will be followed by CAN'T HURRY LOVE in July 2012. For more information about Molly, visit her website like her Facebook page, visit the Harlequin Superromance blog and like the Harlequin Superromance Facebook page. Many of you know Janga as a guest reviewer here at The Romance Dish and proprietor of her blog, Just Janga. She's a retired literature (emphasis on Southern Literature) teacher who, in addition to being a freelance writer, is also an occasional guest blogger at Heroes and Heartbreakers and hard at work on a contemporary romance manuscript of her own. Follow her on Twitter @janga724. I loved this interview and Janga, brava my dear, for coming out of the closet and proudly proclaiming yourself as a reader of Romance. As an English major and former teacher, I am ashamed that others ridiculed you - they just don't know what they are missing. If I could interview an author and be interviewed by that author in return?? The author would be Kathleen E. Woodiwiss ... I'd love to have been able to talk with her about her techniques and how she could write as many as 5 books at once. Thank you, Molly and Janga, it was a delight. Do you know, Amy, I've never read Woodiwiss. One of these days I'm going to have to sit down and lose myself in her stories. I too love this interview and I'm so proud of Janga for coming out of the "clandestine romance reader" closet. I'd have missed out on so many wonderful authors had she not chosen to share her love of romance with others! Such a wonderful interview to read through thank you. My choice of who to interview is also Kathleen E. Woodiwiss as well as Judith McNaught. PJ, I recomend you read Woodiwiss's Ashes in the Wind, one of my favorite historical romance. It's a long read but I didn't want it to end. I think a re-read is in order. Molly I have a few of your books on my e reader I must get to them soon. Janga loved the interview and your questions and answers I would love to do reviews they way you Ladies do I have done a few but they never seem to be as good but I am practising. 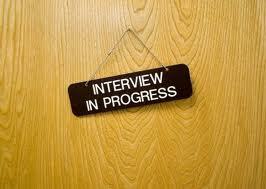 I am not sure who I would like to interview and be interviewed by so many great prople around. Oh I love these little personal bits. I don't have any questions for Molly or Janga right now. If I could interview anyone it would be Louisa May Alcott and I would have to take her to task for allowing Beth to die. I am 60 years old and the first thing I think of in my early reading experiences it is Beth dying. Tore me all to pieces, my mother said I cried for days. Thanks, Amy. The interview was fun. Molly was amazingly generous to take time away from her writing and family to answer all my questions. Five books at once? Wow! I'd like to know how Woodiwiss did that too. PJ, I love talking books with you. And I know every time I get one of those you-should-read-this messages from you that I'll be adding another autobuy author to my list. Thanks, Eli. Fifteen book reviews is a big investment of time and effort. Congratulations on a great start--and best wishes on adding to your review portfolio. Hi, Na! Woodiwiss is a popular choice. And McNaught! I'd love to interview her too and ask how it feels to have written a book that generated the passionate responses that Whitney, My Love did. Dianna, I still weep buckets at Beth's death. I had to call a sobbing break when I read it to the oldest grand. The first live drama production I ever saw was an adaptation of Little Women, and I cried so hard when Beth died that I could barely see the rest of the play. I have to make a trip to the reference section of my university library this morning, so I'll be away for a bit. But I'll be back this afternoon. I'm sure Molly will be dropping by later. Loved the interview! If I could interview anyone it would be Louisa May Alcott too but I have questions about Eight Cousins and it's sequel. I want to know about the weddings and what happens to both Rose and Phoebe. I would also like to know what she thinks of the progress of the suffrage movement and modern women's rights today. What a great interview I really enjoyed it. Thanks for sharing! Eli, fifteen books reviewed is a great start! Na said, PJ, I recomend you read Woodiwiss's Ashes in the Wind, one of my favorite historical romance. It's a long read but I didn't want it to end. Dianna said, If I could interview anyone it would be Louisa May Alcott and I would have to take her to task for allowing Beth to die. I am 60 years old and the first thing I think of in my early reading experiences it is Beth dying. Tore me all to pieces, my mother said I cried for days. I'm sure many of us shared that same experience, Dianna! Janga said, And McNaught! I'd love to interview her too and ask how it feels to have written a book that generated the passionate responses that Whitney, My Love did. It would be fascinating to hear what she has to say about that. It's a very polarizing book. Readers either love it or hate it. There doesn't seem to be much in between. Molly writes wonderful books, Kellie! Maria said, If I could interview anyone it would be Louisa May Alcott...I would also like to know what she thinks of the progress of the suffrage movement and modern women's rights today. Wouldn't that be a fascinating interview? hey guys - I'm late to the party here - we're all home with a fever. I will say the reason I was so excited to interview Janga was that I felt like her reviews were a conversation with a book loving friend. Thoughtful and particular. It was my pleasure being a part of this! oh Dianna - I totally understand - such a formative experience reading Little Woman - such tragedy. It was like we all went from reading safe happy novels and then bang - Jo dies. ooops I meant Beth died. I would love to interview McNaught and Lowell too, to ask how all those characters link up thier heads, and which characters they still wish they had a chance to write. I know Lowell had a few brothers kicking around she hadn't gotten to. I've also just finished the George RR Martin books and I have A LOT of questions to ask him. Has anyone else read these books? WOW! Has the fact that I'm on serious cold medication become apparent? Oh PJ it was such a pleasure meeting you at that bar in NYC - such a friendly welcoming lady. I'm so glad we struck up a conversation! Eli - good luck with the reviews - they are hard to write. I have nothing but respect for reviewers who can entertainly and respectfuly convey thier opinion and the synopsis of the book. Not easy. Hi Molly! It's wonderful to have you here today. Thanks again for agreeing to do this interview in the midst of your busy writing schedule and family trip to the other side of the world. I'm over-the-moon thrilled with how it all turned out. You two did a fabulous job! So sorry to hear you and the family are under the weather. There's a lot of "stuff" going around this time of the year. Hoping you'll all be feeling better soon! Molly, I'm counting down the days until CAN'T BUY ME LOVE. I have a particular fondness for sports playing heroes, especially football and hockey (my college boyfriend was a hockey player). Hey, this was great fun. Can you do this again, Janga and Dishes? Molly, so looking forward to your single titles. As you know, I'm a huge fan of your SuperRomances. Did you know I found you via the wonderful Sarah Mayberry who told me I HAD to read you? How's that for fans in high places? Hmmm, I'm not sure who I'd interview. Maybe Jane Austen if I could go back in time or Diana Gabaldon now. PJ - my husband is a rugby player - 41 years old and still out there every saturday. And he has a lot of friends from Rugby that we were able to visit in New Zealand. I was totally not expecting to love the rugby like I did - but I did. My kids were very into it and it was just the hugely cultural thing - every night there was a match we'd take our kids into a bar - where there were a bunch of adults with kids doing the same thing - and it was just FUN! Of course it doesn't hurt with guys who look like Sonny Bill WIlliams and men who play like Richie McCaw - loved it! Gannon - Hugh Jackman is a great choice for a dinner companion - so charming, so delicious and he can sing - what's not to love? Two wonderful interviews -- thank you! and I so agree: Happy endings are my favourite things about romance novels ... well, and the heroes! Jenny, I think we all agree with you about the heroes. Your Jed is definitely one to sigh over. Thanks for all the kind words, everyone. I'm sorry I didn't get back to chat. What I thought would be a couple of hours turned into several times that buried in research tomes that do not circulate. Even with all that's available online these days, sometimes finding the right information requires researching the old-fashioned way. Janga - But sometimes researching the old fashioned way is more satisfying ... at the moment an old fashioned quiet library sounds blissful. It's a noisy morning in my corner of Australia, today :) I hope you got all the info you needed! Anna Campbell said, Hey, this was great fun. Can you do this again, Janga and Dishes? Glad you enjoyed it, Anna! I'd love to see us do something like this again! Hi Jenny! Thanks so much for stopping by! Molly, you said the magic word(s) in my book - series and family. I love them and am addicted to them. I think Janga's done more for romance reader's TBR piles than any single publishing house out there. I know she increases mine regularly and has been single handedly responsible for hours and hours of some of my best reading. Thank you, friend! What a terrific interview, Molly and Janga! And Janga, add me to the list of those happy that you "came out" as a romance reader! Irisheyes said, I think Janga's done more for romance reader's TBR piles than any single publishing house out there. She's done the same for mine, Irish! Between Molly's computer virus and human virus and my crazy work schedule and leaky senior memory, neither of us said anything about possible giveaways when we were planning this interview. Sorry this is late but Molly has very generously offered an ARC of her first single-title book, CAN'T BUY ME LOVE to one randomly selected person who leaves a comment on today's blog. The book is a July release so ARCs won't be available for a few months yet but, as soon as Molly receives them, a copy will be winging its way to today's winner! Ohhh J.K. Rowling's brain...that'd be a good one to pick. I'd also like to talk to J.R. Ward to see how she plans out that BDB series - I am an addict! Irish Eyes - I'm with you - family and series gets me every time. 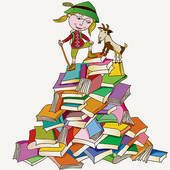 As long as alll the books can be read stand alone - I can't think of anything to complain about - I love 'em. Oops! lol! That's supposed to be "here at TRD!" Wow, what a double interview. Interesting and enjoyable. Hard to think who I would like to interview. I was thinking of some of the current romance writers until I read the comments about Alcott. You think of many of the female writers of the past - Alcott, Dickenson, Austen, Beatrix Potter - they seemed to have such short or solitary lives. Any of them would make for a good interview. A roundtable discussion among the group would be awesome. An absolutely terrific set of reviews! I see you are starting off your 3rd year with some very interesting new innovations; I love them, please do it again! Judith Mc Naught is no longer writing. That is a question I would have to ask her in an interview, then I would have to beg her to start writing again. I would love to interview L M Montgomery's Anne Shirley. I loved her stories. She was quite the young woman!! I enjoyed your Scandalous O'Neill's series!! Very nice interview. Do you feel that writing Harlequins is a good training ground for going onto writing full-length novels. So many romance writers started their careers at Silhouette/Harlequin. So I'm late to the party, but what a fantastic interview! What a great idea, Molly & Janga!! There are so many authors (too many to name) I would love to just sit down, enjoy a cup of tea and chat for a while.